Largo, Fl. 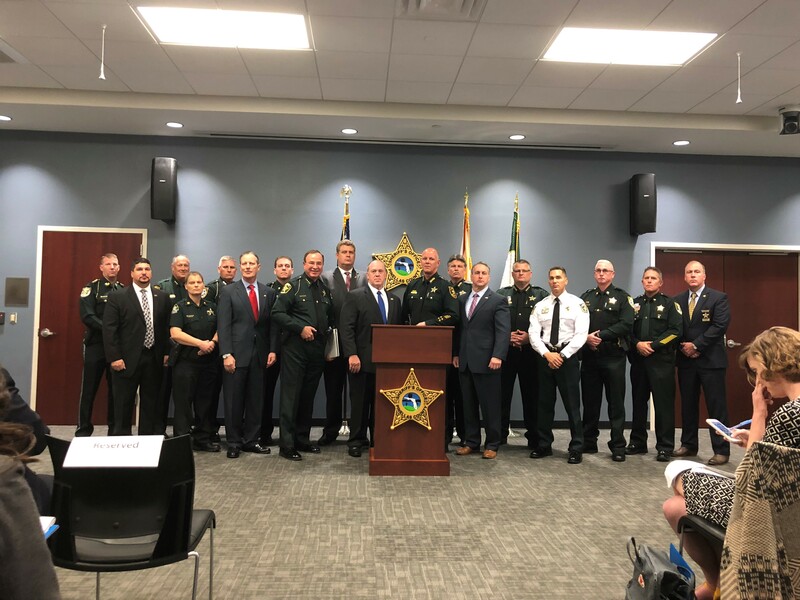 – U.S. Immigration and Customs Enforcement (ICE) announced 17 Basic Ordering Agreements (BOA) with various Florida sheriffs that aim to prevent the release of criminal aliens back into the community. ICE places a high priority on enhancing public safety through the arrest and removal of criminal aliens from the United States. However, when an alien is arrested on a local criminal charge, all too often, they are subsequently released before ICE has the opportunity to pick them up from a local jail. ICE’s valued state and local law enforcement partners are being challenged in court for facilitating the secure and orderly custodial transfer of criminal aliens to ICE. Recognizing these challenges, the National Sheriffs’ Association (NSA) and the Major County Sheriffs of America (MCSA) worked with ICE to develop a new process to clarify that aliens held by these jurisdictions are held under the color of federal authority, thereby affording local law enforcement liability protection from potential litigation as a result of faithfully executing their public safety duties. “Today’s announcement is about public safety – period. For years, sheriffs have had to choose between releasing criminal illegal aliens from their jails back into the community, or exposing themselves to potential civil liability. Both choices are unacceptable and that is why the Basic Ordering Agreement model being unveiled today is the linchpin in allowing us to faithfully execute our public safety duties,” said MCSA Treasurer and Pinellas County Sheriff Bob Gualtieri. A BOA is an existing procurement tool for acquiring a substantial, but presently unknown, quantity of supplies or services. A BOA is not a contract, but rather is a set of terms negotiated between an agency and a service provider that contain a description of services to be provided, terms applicable to a future order between the parties, and a method for pricing, issuing, and delivering on future orders. “Today’s agreement makes our communities, neighborhoods – and our nation – safer. Suffering will be reduced, and lives will be saved. The immigration detainer issue has been difficult and challenging. Under this new process, sheriffs holding illegal criminal aliens in their jails and prisons are afforded liability protection from potential litigation when faithfully executing public safety duties. America’s more than 3,000 Sheriffs across the nation are grateful to the administration, Department of Homeland Security, and the superior leadership of Deputy Director Homan, for listening and working with us to advance and implement this commonsense solution,” NSA CEO and Executive Director Jonathan Thompson said. Participating jurisdictions are considered service providers and house detainees upon ICE’s issuance and their acceptance of a Form I-203 (Order to Detain or Release Alien) accompanied by: (1) a Form I-247A (Immigration Detainer – Notice of Action); and (2) either a Form I-200 (Warrant for Arrest of Alien) or Form I-205 (Warrant of Removal). For any order placed under the BOA, ICE would reimburse the service provider for up to 48 hours of detention, under applicable regulations. ICE is instituting the BOA process with a small number of partner jurisdictions in order to ensure a smooth roll-out, but intends to gradually expand implementation with willing law enforcement partners over the coming year. The participating county sheriffs are Pinellas, Lee, Manatee, Bay, Walton, Hernando, Brevard, Polk, Indian River, Charlotte, Monroe, Sarasota, Columbia, Santa Rosa, Suwannee, Hillsborough and Pasco.